Acupuncture, as a part of Oriental Medicine, can remedy physical and emotional ailments, improve state of mind, enhance recuperative power, strengthen the immune system, and also heighten one’s capacity for work & creativity. Chinese Medicine is a Holistic, Natural medicine. The medicine itself has a history of over 5,000 years and is one of the oldest continuously utilized medicines in the world. More people use this type of medicine than any other on this planet. It encompasses: Diet (nutrition or weight loss) ; Exercise; Stress Management; Massage, Positive Thinking, Good Sleeping habits; Herbal Medicine and Supplements; as well as Acupuncture or Acupressure. In the view of modern Oriental Medicine the body is comprised of a network of energy pathways called meridians. When a pathway is blocked, the energy flow is decreased or stopped. Illness, pain, or a feeling of general disease can result. Filaments, as fine as human hairs, are inserted into selective sites on the surface of the body to unblock the pathways and allow the meridian energy to flow normally and to restore the body to its natural state of balance. In western physiology, we would call these Neurological Nodes, as these places have been scientifically designated as places where nerves, muscles, tendons, ligaments and blood vessels have an influence on the body’s health and wellness. All flows of nutrients and oxygen in the body are controlled by the vascular (blood vessel) system. Ancient Chinese doctors discovered that when you inhale the lung extracts “vital vapor” or “Qi” from the air. It then transfers this “vital vapor” to our blood vessels, and the blood then carries the oxygen ( “Qi”) to nourish and animate every cell of our body. If there is any disturbance in the flow of oxygen or the flow of blood, it will lead to a lack of ease or dis-ease in our body. Today we call Qi oxygen, and we credit the Chinese for this discovery well over 3500 years ago. According to Chinese medicine, Qi is the vital energy which flows through a system of channels called meridians and regulates the bodily functions. All the vital activities of the human body are explained by changes and movement of Qi. It is important to realize that all the healing powers of the body are inherent (existing naturally inside) in the blood. But if an area of the body is sick or injured, and there is not enough blood flowing to the affected areas, it is extremely difficult for the body to ever heal the injury. In our blood we have hormones, neuro-chemicals, anti-inflammatories & pain relievers; it is just a matter of having the body in balance. Acupuncture works by increasing Qi/blood flow to the targeted areas, thereby allowing the body to heal itself . 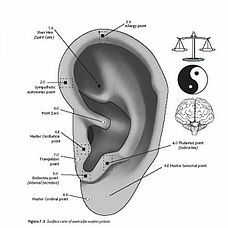 The human ear has as many as 200 Acupuncture points that act as a “mini map” of the body. Each acupoint on the ear, when treated, triggers electrical impulses from the ear, via the brain, to the specific area of the body that is being treated. Stimulating these acupoints using needles, low-level, cool lasers, gold pellets or tiny magnets can reduce pain and stress as well as resolve other physiological and psychological issues, all while concentrating on a very isolated portion of the body. Electro Acupuncture or E-stim is used to promote circulation in particular areas of the body, stimulate sensory and motor function, and relieve muscle spasms in addition to other uses. Acupuncture filaments are inserted on specific pressure points on the body and then small electrodes are placed near the Acupuncture Filament. The pulses provide consistent, controlled stimuli to the pressure points with no discomfort. This method is extremely effective in treating neurological diseases, as well as providing relief from pain and improving function, especially on the body’s motor points. 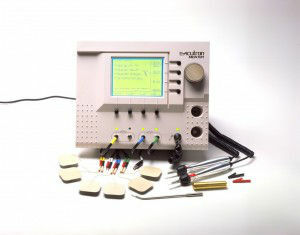 Acupuncture Wellness not only offers the best of Traditional Chinese Medicine, but also cutting edge technology. Marc Cutler was the first to be certified to practice Laser Acupuncture in North Carolina. Low-level Laser Therapy also known as cold, or cool lasers is a technology which has been proven to be remarkably safe, painless and effective in reducing the amount of time it takes to heal, as much as 1/3 to ½ the time to heal by utilizing the laser as compared to without. During a LLT treatment, a cellular photochemical reaction is stimulated by the laser and the photons from the laser affect the tissue on a cellular level. The cell’s membrane then changes due to the photochemical reaction and the mitochondria (also known as the Power house of the cell) which then makes adenosine triphosphate (ATP), which then accelerates the healing at this deep cellular level. Stimulated Nerve Function: Laser light speeds nerve cell process and assists in reconnection of nerves which may normalize damaged nerves, decrease pain and numbness associated with nerve conditions. Production of endorphins which dull pain sensations in the brain. With well over 200 clinical studies – many of which are double-blind placebo-controlled – and in excess of 2000 published articles on LLLT, this innovative newer technology has a well-documented research and application history. LLLT is now being considered a therapy of choice for many difficult pain management challenges such as fibromyalgia and myofacial pain. Laser acupuncture delivers the same health benefits as traditional acupuncture, but without the use of filaments. Instead, low powered light rays are used to accelerate and enhance the body’s natural ability to heal damaged tissue and restore normal function. Energy produced by cool lasers prompt the production of collagen and ATP (the energy source needed for cellular functions), promotes blood circulation and boost the release of growth factors and the removal of waste products from cells. Acupuncture Wellness is one of just a few progressive practitioners certified in low level laser therapy. Treatment is simple and painless, making it ideal for children or patients who are fearful of needles. There is no pain, nor is there an increase in the skin’s temperature from the laser. Laser acupuncture is ideal for treating open wounds, soft tissue injuries such as sprains, dermatological conditions including acne and eczema, and joint ailments like arthritis and Carpal Tunnel Syndrome. Lasers stimulate nerve function in damaged tissue and act as an anti-inflammatory, which means decreased healing time and increased joint mobility.